I love this card. The For Your Country stamp set was one of the first on my list in this new Stampin Up catalog. 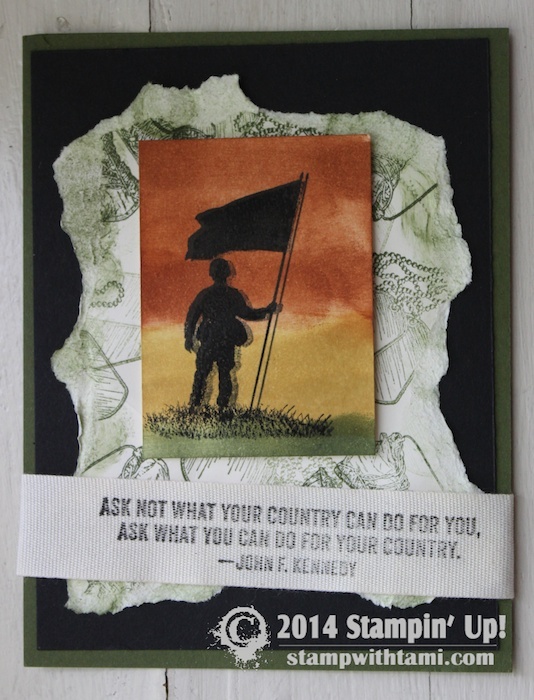 The John F. Kennedy quote is “Ask not what your country can do for you, ask what you can do for your country.” Perfect for Vets, our loved ones in the service, etc. The background behind the solder was created with sponge daubers. the layer behind that was randomly stamped with the “dog tag”image, then torn around the edges. The JFK quote is stamped on Cotton Ribbon with Staz On ink. Created by Joann Wiemers. I love this new stamp set “For your Country Veterans” I am sure when I get it, it will be well used as I have 2 brothers and a lot of friends that are veterans.